Archive – La Nova Singers… Blog! There was an autumnal chill in the air as an audience was ushered into the warmth of West Cliff Baptist Church; on this night, La Nova Singers would give a concert in aid of Macmillan Caring Locally. Neal Williams, the trust’s secretary, was kind enough to attend and introduce the evening. 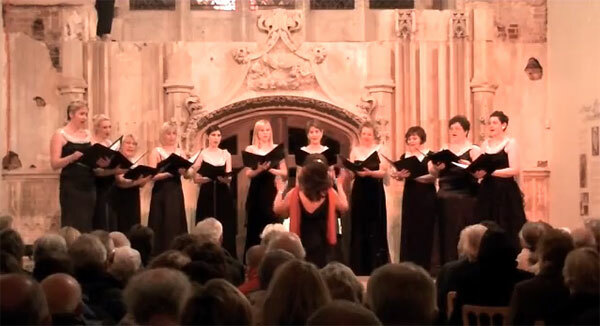 The singers performed music from right across their repertoire, beginning with Baroque favourites by Handel and Mozart (which some of the audience would remember from the group’s spectacular Somerley House concert in 2009). John Rutter made a brief appearance with some characteristically memorable pieces, and the first half ended with the ethereally beautiful ‘In Paradisum’ from the Fauré Requiem. Steven Howard brought an added dimension to this and other pieces with his flute accompaniment, which blended beautifully with the voices. Tonight was a special occasion, being the first official concert performance of a new group of singers: the Bella Nova quartet. Although the four girls have only been singing together for a year, they charmed the audience with their renditions of Howard Goodall’s Vicar of Dibley theme, Brahms’ Lullaby and Eric Clapton’s Tears in Heaven. The concert’s second half opened in darkness with Puccini’s Humming chorus, the singers processing towards the stage as they sang, each illuminated by a small votive. The audience then enjoyed the infamous Cat Duet; Paul Simon’s Bridge over Troubled Water; and Su Convy’s star turn as soloist in “Can’t Help Lovin’ Dat Man”. The concert ended as it began, with a rousing rendition of the Hallelujah Chorus; and Michelle Nova extended the group’s thanks to their new pianist, Victor Burbidge – who, despite having only been playing for the group since August, has already made a big impression! La Nova Singers will now be busy preparing for their festive offering, ‘Songs of Christmas Past’, at Highcliffe Castle on 14 December. La Nova Singers gave a one hour family Christmas concert at the West Cliff Baptist Church, Westbourne which included favourites such as Silent Night, First Mercy, Do You Hear What I Hear and White Christmas. The ladies have entertained many people over the festive season in addition to their main concerts. They have appeared as special guests during a Christmas church service, sang for patients at Bournemouth Hospital and performed on the stage in the Square, Bournemouth to raise money for Julia’s House with a mixture of traditional and modern Christmas songs performed to their usual high standards. The group has also welcomed two new sopranos, Josephine and Jackie. La Nova Singers performed a one-hour concert on Saturday 20th November on the stage in Bournemouth Square to raise funds for Children in Need. The event was a great success and the singers collected over £300 from the generous shoppers of Bournemouth! The singers would like to thank all those who help with the collecting and our pianist Christine Langton for braving the cold and giving their time so generously. The weather held out for La Nova Singers first open air concert held in Ibsley near Ringwood. Nearly 100 people took the opportunity to enjoy a picnic in the lovely garden with some people even bringing out their best china and candelabras. Perhaps next year we will have to think about a prize for the best picnic! The singers performed a variety of music from Handel’s Silent Worship to the very well received Rhythm Of Life by Cy Coleman. The concert finished with a rousing rendition of Rule Britannia with the audience joining in and waving their union jacks. La Nova Singers would like to say a special thank you to Sue & Malcolm Lambert for hosting this event in their garden, Christine Langton their pianist, Lisa and Sally who sold tickets and were in charge of refreshments and to Steve Howard who compered the event. Following our performance in February with Vintage Brass, La Nova Singers once again shared the stage with an assortment of local musical talent at the Mayor of Christchurch’s Charity Concert. This wonderfully varied event took place at the Regent Centre on 1 March, St David’s Day; and proceeds from the concert will be going to the Mayor’s chosen charities. The audience enjoyed singing from Highcliffe Junior Choir and ‘Light and Shade’; and performances by the Air Training Corps Band, Highcliffe Brass Band, Taverners Big Band and the Band of the Royal British Legion. 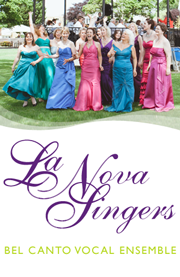 La Nova singers sang a small selection of our most popular pieces, including ‘Tonight’ from West Side Story, and the beautiful ‘Cantique de Jean Racine’ by Fauré. The concert finished with a nod to the Welsh national day, with audience and performers joining together to sing some traditional Welsh hymns. If you didn’t manage to attend this special concert, a DVD of the event (with proceeds going to the Mayor’s charities) is available from Netfora.tv (http://www.netfora.tv/charity_concert_2010.html). Look out for the special lighting effects in the first few minutes of our performance!